New-York Lorod founders Lauren Rodriguez and Michael Freels aren’t afraid to admit that they don’t have it all figured out. With a Spring line ready merely a year after Lorod first launched in 2015, they’re the first to joke about how scrambling was the norm initially, as they were “trying to be adults.” Neither have ever run a business before, but the duo has already burst onto the scene with collaborations including Sorelle and artist Grear Patterson — not to mention high-profile buyers like Assembly and Opening Ceremony, or in other words: full-blown adulting. 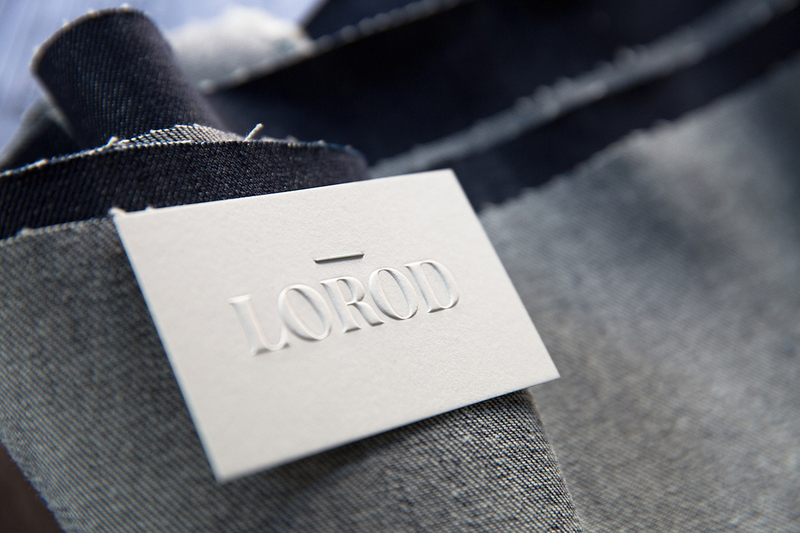 But then again, they have no reservations about forging ahead at full speed and learning as they go with the rhythm of an established studio; it’s simply business as usual over at Lorod. 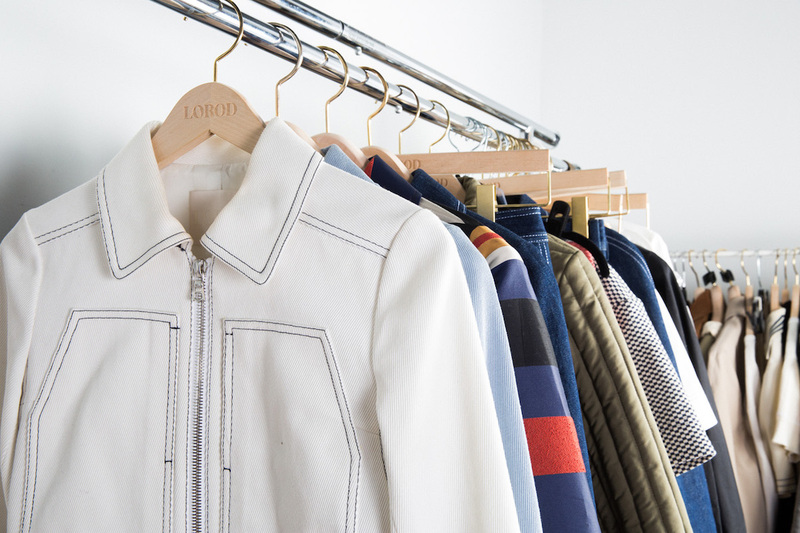 In a way, Lorod hails a new kind of women’s workwear by honing in on the best of what classic men’s workwear has to offer. The line stemmed from a lack of authentic vintage fits, aka fits that don’t sacrifice all the off-the-cuff effortlessness in their modern iterations. Durable fabrics and unostentatious details inform much of their work, and it shows. They’ve hit that delicate balance of capturing American classics without leaning heavily towards cliche ruggedness or, conversely, skewing to the ever pervasive minimalism made everywhere these days. 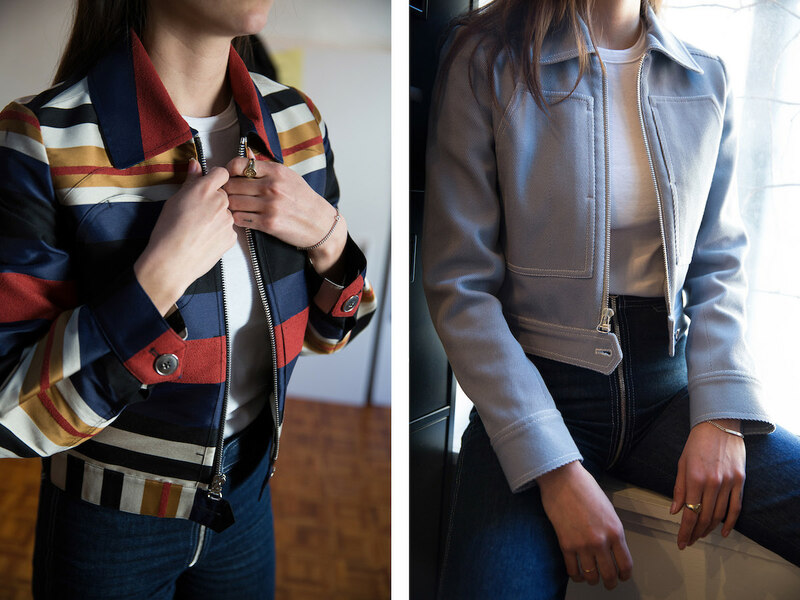 In keeping in line with their Americana homage, buyers can rest assured that all their pieces are in fact made in the U. S. of A. Read on to see where these vintage aficionados find their design inspiration, the exciting pace (and very real growing pains) of running a business, and why they had to deny Vogue for strategic reasons. How did you guys know that you wanted to start a clothing line? Lauren: Being in art school sort of turned me off of being a working artist. 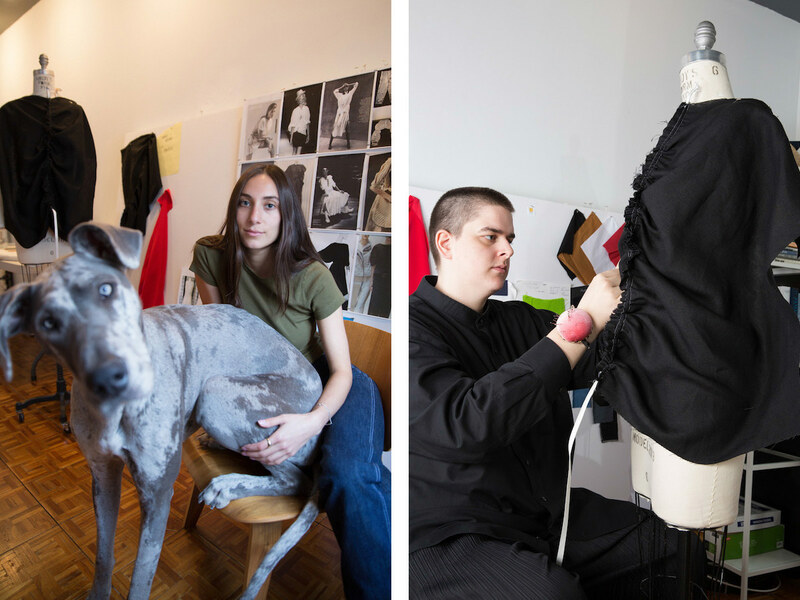 I had an interest in going to school for fashion and then didn’t want to because of the industry; it was intimidating, and it just felt overwhelming, so I took the fine art route. When I graduated, I had this desire to make clothes and design and really wanted to start a brand where I could incorporate those things. After [graduation], I felt like I had so many peers who were in that weird phase after college, and I thought it would be a cool thing to have a platform or space where we could do collaborations with friends. Michael: Lauren broke off into painting and sculpture, and I did womenswear. Then we ran into each other at a Halloween party, and she was like, “I’m trying to make clothes, but I don’t know how to make clothes,” so I was like “let’s do this”, and it just sort of evolved from there. It grew into a monster, I think. Lauren: It’s sort of a nickname that I grew up with. A lot of my friends called me Lo, and then a lot of people called me L-Rod — my last name is Rodriguez — and then it sort of transformed into Lorod. Our aesthetic is sort of like these boyish interpretations of workwear for women that are more tailored for women’s bodies. I think that the name sounds a bit ambiguous but slightly more masculine. They’ll think of hot rod when they hear it — it does have a masculine connotation to it, but our logo looks a bit more feminine. Who designed your site? It looks awesome! Lauren: Thank you. We worked with Pentagram. Michael: We naively emailed them and were like this will be funny. Then one of the partners Natasha Jenn took us under her wing, and she was like “Your budget is way too small, but I don’t care, I’ll work with you.” So they did all of our branding. It was an 8-month process or something to do all the material. The whole process seems so seamless compared to other start-up companies that don’t receive attention until several years after inception… What resources were you tapping into beyond your luck with Pentagram? Michael: I mean we sort of scraped it together just like everyone else. Maybe the distinction is that Lauren and I went into this full-time really early on, which we were lucky to do. Maybe that’s the difference? Whereas a lot of people you know have to work part-time jobs or have to consult for someone else while they’re doing their own brand, so I think that focus really helped. Lauren: As soon as I graduated, I was working a couple of odd jobs and had this overwhelming sense of connection to young people in New York. You go to a bar, and it’s unbelievable; there’s someone who works for Vogue and someone whose the owner of this store and it just felt silly to not take advantage of what was right in front of us. There’s no other place like New York City. Youth is on our side. Lauren: It’s true! Even being a person on Instagram. Vogue found us on Instagram. So, being young and in-the-know helps. We have a good friend of ours who consults for a brand and does styling who connected us to the buyer at Opening Ceremony, and we also had a friend at Assembly. Well, going back to that Vogue story, they literally just reached out to you via Instagram? We were just trying to produce our clothes, and it would have been a waste of press had they done a story on us at that point because no one could buy our clothes, no one could feel them or see them in stores, so we waited out a little bit. Then, we were able to do an article with Vogue when things were going to stores, we did some pre-orders on our website, so it worked out. It seems like you guys were moving super quickly in terms of the year before and presenting, etc. Was that always the expectation? Michael: It just happened. When were trying to be adults and write a business plan, we’ll only do pre-collections and stay out of the mess of New York Fashion Week and focus on the clothes. But we were anxious to get feedback and eager to make our own production and see how that goes, so we did Spring with no press, and we didn’t release a lookbook to focus on the product. I mean, the product looks great. 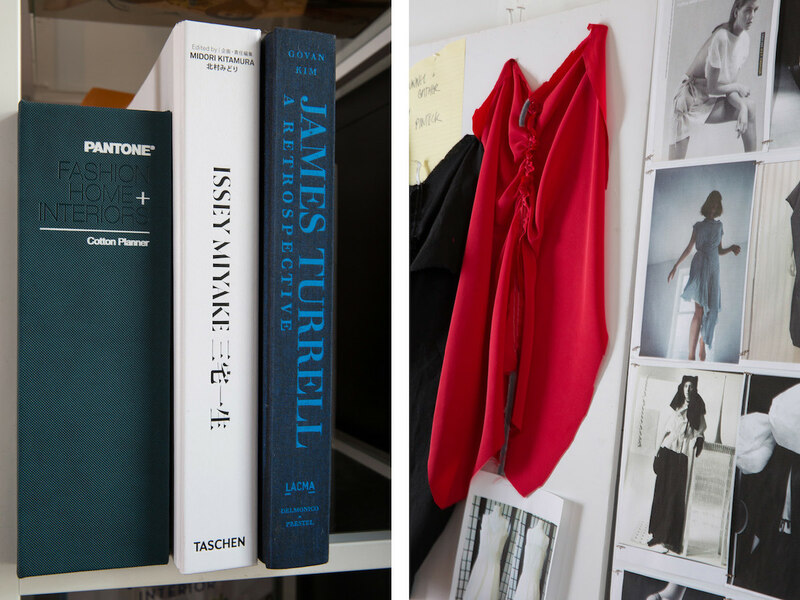 Can you walk me through your design process and from Spring and what’s changed into the latest Pre-Fall? How do you guys put your concepts into motion? What are your inspiration references/materials? 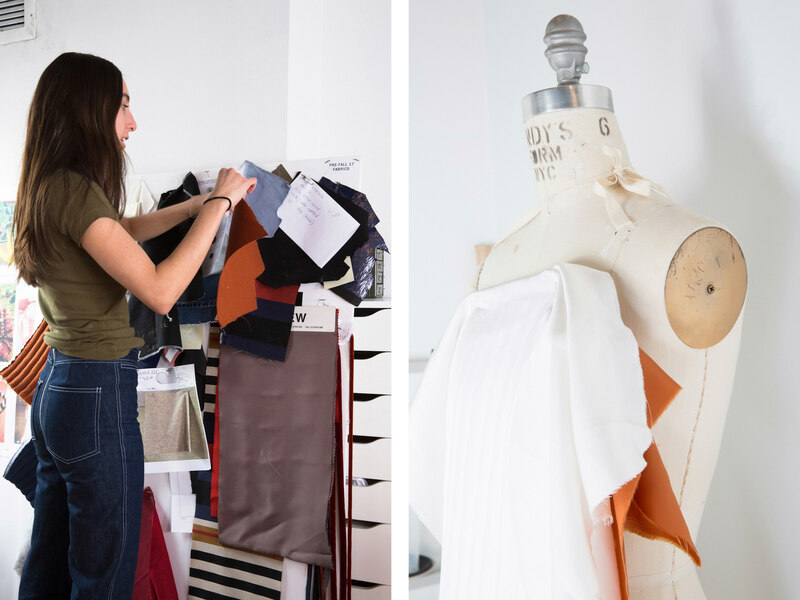 Lauren: I was feeling frustrated with the fit of clothing, and I’d end up buying a lot of vintage menswear and tailoring it to fit me, so that’s where a lot of the fit comes from for pants: details from men’s workwear. We often start with a vintage garment; we do a lot of sourcing of uniforms, military-grade WWII, and then some more feminine things will play in, then we talk about details and closures. We do a lot of image boarding. Michael: It starts with a lot of imagery. And then from there, during mock-ups, figuring out which shapes we’re gonna push for the season. Our first season, we started off with 12 styles that were the essentials of the brand. We thought: What speaks the most to the customer? What speaks the most to what we’re trying to accomplish? So the crop zip-up jacket, the short coat, the carpenter pant, the five-pocket jean — these are our basics. Lauren: We want our customer to be a girl who knows what she wants to wear and where to find it. It’s comfortable, and everything is functional. There’s nothing more frustrating than having a beautiful pair of pants that doesn’t function. We also like the idea of the fabrics being substantial enough to actually work in them. I’ll wear them to clean the house or go to the dog park, you know, you don’t have to feel like everything is super precious. It seems like the whole design process is super collaborative, but is there any one part of the design or production, or perhaps PR that you guys own individually? How does the conversation start when delegating? Michael: I tend to handle development and design and fabric R&D, and Lauren focuses more on production and press, and sales. But sometimes I have a hand in sales, like what stores we go to, and sometimes she has a hand in design — it’s just kind of this cesspool. Michael: Every day is different, whether it’s fittings, design research, putting out fires. Like having fabric that a factory doesn’t want to cut into panels, but [reiterating how] it has to be cut into panels to be washed. Basically just trying to mitigate what the washhouse wants, what the factory wants, what we want, and trying to make everything work. Lauren: I never anticipated as many wheels turning at the same time as they do. You’re doing ten things, and for these things to happen, these other ten things have to happen. It’s a lot at once, but I mean, it’s cool. People always say there’s no better way to learn how to do this than just doing it. So it’s happening, and it’s good. What do you think was the most difficult growing pain? Michael: We recently told that you should feel comfortable doing things you don’t know how to do. That made us feel better because we’re constantly doing things we don’t know how to do or what we’re unfamiliar with. Lauren: Every day is like problem-solving. One of the hardest things we face is that it’s crucial for us to produce in America, so everything we make here is in midtown. It’s been amazing, and it feels cool to be able to sustain production in the U.S., supporting fair wage labour and everything — but it’s really expensive and very hard. We try and source as much as we can from the U.S. Our other fabrics are from Italy and Japan. Oh, nice. So where’s your denim from? Michael: It’s from Cone Denim Mills. They had previously sponsored my thesis collection in college and gave me a bunch of free stuff, so I reached out again, and am trying to sustain that relationship. Ideally, we’d be sourcing everything from the U.S., but there is such a limited scope of what fabrics are being offered. Lauren: We look at brands that are making beautiful things in larger quantities, and they’re able to sell things at a lower price point because it’s made in China, and it cost them practically nothing to make. We’re tiny, and we only have three stores, so our numbers are really low. Paying a surcharge to get things made the way we want them to be is hard as a young company, but as a young company it’s important to us to produce in the U.S. It’s not like we’re getting huge, huge orders. Is that something you’re actually after? Michael: I mean the economy of scale would definitely help us. And as the demand increases, the styles will probably follow. Also, buyers come in and look at your rack, and they cut it in half, and then they buy half of that, so it’s like offering them more increases your sales in theory, but not always. I think there’s a nice in-between that you can have. Finding that happy medium where you’re not mass, but you’re not so niche that you can’t make a living is kind of the goal. We don’t want to be everything to everyone. It’s specific; once you get so mass, you get so watered down, and it’s like what is that brand? What do they stand for? Keeping it directional is important. Now for some lightning-round questions. What are your go-to places in New York for inspiration, to hang out? Lauren: I spend a lot of time at the Met Library. Michael: The Costume Institute and the Watson Library. Spending a lot of time at galleries and seeing what our friends are doing creatively. What are your favourite vintage stores? Michael: Our favourite vintage spots are Melet Mercantile in New York, Replika Vintage in LA, and random vintage tradeshows that pop up every once and awhile! Any advice you want to impart on young designers? Lauren: Share your ideas with your peers! Working collaboratively often results in an unexpected but more complex outcome. Michael: My advice is to have fun! Keep up with Lorod and their latest collections through their website and Instagram @lorod.